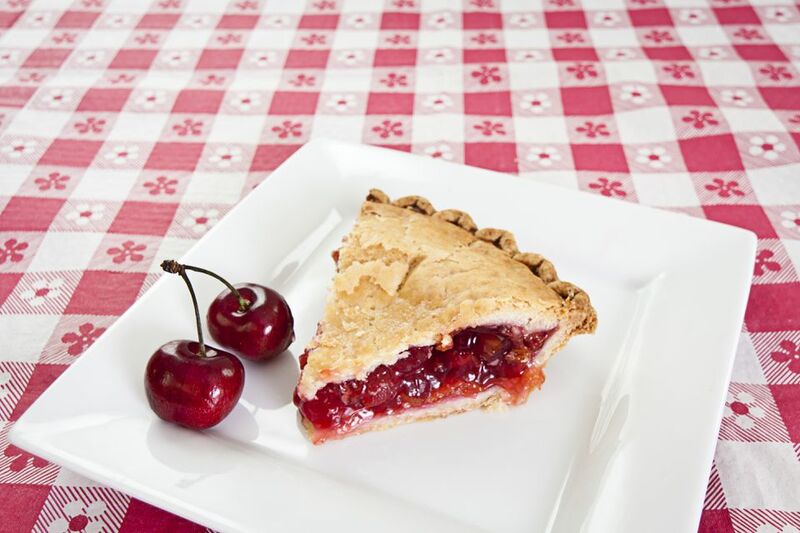 This simple recipe for a homemade vegan cherry pie uses a double-crust pastry. If you've got a bumper crop of cherries on your hands, here's an incredibly delicious and vegan way to use them all up! Cut in the vegan margarine, mixing until crumbly. In a separate bowl, whisk together the vegetable oil and water. Then add to the flour and sugar mixture, mixing just until dough forms. You may want to use your (clean) hands at this stage, in order to make sure all the flour gets incorporated well. Once the dough pulls together and there's no extra flour, cover the dough with plastic wrap, then chill in the refrigerator for at least 30 minutes. After 30 minutes, remove the dough from the refrigerator and roll out onto a lightly floured surface to about 1/4-inch thickness. Once your dough is rolled out, gently press it into a pie tin, trimming any extra bits along the edges. Combine the cornstarch and 1 1/4 cups sugar in a mixing bowl. Add the cherries while still hot, stirring to combine well. Place the cherries in a medium saucepan over medium-low heat, cover, and cook until most of the juice has been extracted, about 3-5 minutes. Return the mixture to the stove and heat over low heat for another couple minutes, just until thickened, stirring frequently. Allow to cool. Place on prepared pie crust in pie pan, then fill with cherry mixture, once cooled. Dot the top of the cherry mixture with dabs of cold vegan margarine. To place the double crust on top, moisten the outer edge of the bottom pie crust, then carefully place the other crust on top, crimping the edges together. Make a few slits in the top crust so that steam and moisture can escape, then sprinkle the top with the remaining 1 tablespoon of sugar. Bake pie for approximately 50 minutes. Remove from the oven and allow to cool before serving, as it will be very hot.